Highway 150 West - to Evergreen (approximately 9 miles) to Highway 945. Turn left onto Highway 945 (towards Cleveland), approximately 8/10 of a mile. Turn right down Oakview Lane. Farm parking is the 4th gate entrance on the left. Hwy 150. 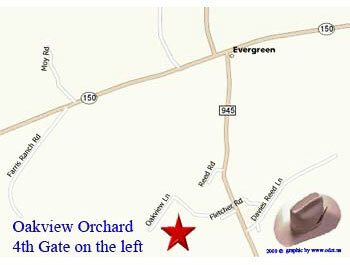 Turn right on Hwy 150 towards Evergreen, (approximately 9 miles) to Hwy 945. 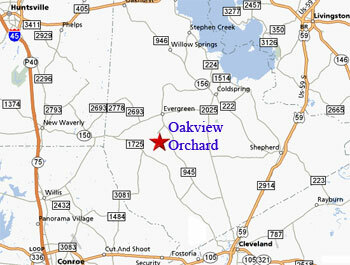 Turn right on Hwy 945 travel 8/10 of a mile to Oakview Lane, turn right down the lane, 4th gate entrance on the left. Oakview Lane, 4th gate entrance on the left. Click here to continue to Search San Jacinto County, Texas! ï¿¿2009 Online Directory of Texas, Inc. and its licensors. All Rights Reserved.